Sprawled across 20 acres in the hinterland of Corbett Country is the abode of the adventure seeker - Corbett Ramganga Resort. Corbett is set in the beautiful undulating Shivalik foothills of the Himalayas in Uttaranchal with the placid Ramganga River flowing through most parts of the resort. The resort has 16 rooms and suites with 10 deluxe Swiss cottage safari tents under thatched cover. Games like fishing, elephant rides, jeep safaris, bird watching, indoor/outdoor games. Payment accepted at frontdesk: All major cards accepted. For above five extra bed rate will be charged. 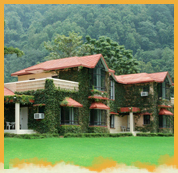 Accommodation for two nights in respective category, all meals ( i.e. bed tea, breakfast, lunch, evening tea and dinner) starting with lunch on day one and ending at breakfast on day three, all currently applicable taxes.